Sleeve Shortening ($12.95) Alteration Amount 0.5" 1" 1.5" 2" 2.5" 3"
This Oxford is all but casual. The White Brody Oxford is polished and refined, and finished with a light treatment to help prevent wrinkles without losing the softness of the cloth. Complete with our Ledbury Spread collar. Fit: Available in classic and tailored fit. 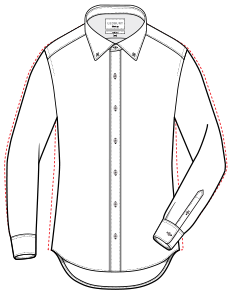 Tailored fit features a darted back for a tailored fit throughout the torso. Buttons: Shell buttons with tension threading to ensure they stay fastened for the life of the shirt. Machine or hand wash in cold water. Hang or lay flat to dry, as machine drying can cause shrinkage. Remove collar stays before laundering. Avoid excessive heat and use little to no starch to prolong the life of the shirt.